In the finest traditions of kooky erstwhile RAINBOW guitarist Ritchie Blackmore, flamboyant Italian metallers RHAPSODY clearly aren't shy of opening themselves up to potential ridicule. 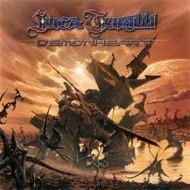 And, unsurprisingly, with guitarist Luca Turilli going solo from time to time, neither is he afraid of assuming the mirth-ridden mantle. The big smirking point with this EP (preceding the forthcoming full-lengther "Prophet Of The Last Eclipse") is that, while his main band remain the self styled purveyors of "Hollywood Metal", Turilli has taken the liberty of unveiling a new genre known as, er, "Symphonic Cosmic Metal". But what pray does this mean to us lesser mortals? Well, in a nutshell, it means that everything on this album pretty much sounds like RHAPSODY. So even if such miniscule genre quibbles make you snigger — and, let's face it, who wouldn't? - it means at the very least you're likely to get a bracing barrage of quality metal. Sure enough, Turilli pulls out all the usual stops, bolstering the galloping guitars with assorted choirs, string ensembles and enough percussion to cause a small earth tremor somewhere in the region of Gate Studio where this session was recorded. As tumultuous as it all is though, and in as much as the likes of opener "Demonheart" and "Prophet Of the last Eclipse" possess soaring choruses, these six tracks aren't about to blow the world of traditionally-styled metal wide open — principally because RHAPSODY have arguably already done it with their benchmark "Symphony Of Enchanted Lands" album, and everything else released since by RHAPSODY and its offshoots has been a variation on a theme. More of the same, then, albeit with symphonic majesty turned up to eleven.